Here Gurdjieff suddenly changed his manner of speaking, and looking at me very directly he said: “You have the possibility of changing, but I must warn you that it will not be easy. You are still full of the idea that you can do what you like. In spite of all your study of free will and determinism, you have not yet understood that so long as you remain in this place, you can do nothing at all. Within this sphere there is no freedom. Neither your knowledge nor all your activity will give you freedom. This is because you have no …” Gurdjieff found it difficult to express what he wanted in Turkish. He used the word varlik, which means roughly the quality of being present. I thought he was referring to the experience of being separated from one’s body. Neither I nor the Prince [Sabaheddin] could understand what Gurdjieff wished to convey. I felt sad, because his manner of speaking left me in no doubt that he was telling me something of great importance. I answered, rather lamely, that I knew that knowledge was not enough, but what else was there to do but study? He did not answer me directly, but without giving any impression of ignoring me, began to speak to the Prince about Temple Dances and their importance for the study of ancient wisdom. He invited the three of us to see a demonstration of Temple Dances by a group of pupils whom he had brought with him from Tiflis. We drove Gurdjieff back to the Grande Rue de Péra, where he said he had an appointment at midnight, which seemed odd. He repeated his invitation to Yemenedji Sokak for the following Saturday. The Prince did not wish to go. Indeed, he never went out at night on any pretext. Mrs. Beaumont and I made our way to Yemenedji Sokak at nine p.m. as directed. When we arrived the only occupant of the long room was a tall man in a white costume and a yellow sash, who was standing in a corner with his back to the room and slowly nodding his head backwards and forwards. Others, both men and women, came into the room. All were wearing white costumes. Both men and women wore tunics buttoned up to the neck. The men had loose white trousers and the women wore white skirts over white pantaloons. No one spoke or took any notice of the others. Some sat cross-legged on the floor, others began to practice various postures and rhythms. Chairs were arranged at one end, and two or three visitors entered and sat down. To our immense astonishment, we saw Ouspensky come into the room, looking neither right nor left and appearing not to recognize us. Soon afterwards Thomas de Hartmann came in and sat down at the piano. I had not suspected that either of them was connected to Gurdjieff. Gurdjieff himself came in soon after. He was dressed in black. As soon as he entered, all the performers stood up and arranged themselves in six lines. They wore different colored sashes, and I expected to see them arranged according to the colours of the spectrum, but for some reason the red was in the wrong place. Hartmann began playing. The first dance was accompanied by a magnificent slow theme that was more like a Greek anthem than an Eastern temple dance. The dance itself was very simple—almost like Swedish gymnastics. Each dance lasted only one or two minutes. The action grew more and more intense. After a time, the straight lines were broken up and the performers placed themselves in some intricate pattern. Before the dance began, one of the men said in English: “The exercise that will follow represents the Initiation of a Priestess. It comes from a cave temple in the Hindu Kush.” This was the most impressive and moving event of the evening. The exercise lasted much longer than the others. The part of the priestess, who scarcely moved at all, was taken by a tall and very beautiful woman. The expression of her face conveyed the feeling of complete withdrawal from the outer world. She seemed unaware of the complicated weaving movements of the men and women surrounding her. I had never before seen such a beautiful dance, or heard such strangely disturbing music. Every evening after dinner, a new life began. There was no hurry. Some walked in the garden. Others smoked. About nine o’clock we made our way alone or in twos and threes to the Study House. Outdoor shoes came off and soft shoes or moccasins were put on. We sat quietly, each on his or her own cushion, round the floor in the centre. Men sat on the right, women on the left; never together. Some went straight on to the stage and began to practice the rhythmic exercises. On our first arrival, each of us had the right to choose his own teacher for the movements. I had chosen Vasili Ferapontoff, a young Russian, tall, with a sad studious face. He wore pince-nez, and looked the picture of the perpetual student, Trofimov, in The Cherry Orchard. He was a conscientious instructor, though not a brilliant performer. I came to value his friendship, which continued until his premature death ten years later. He told me in one of our first conversations that he expected to die young. The exercises were much the same as those I had seen in Constantinople three years before. The new pupils, such as myself, began with the series called Six Obligatory Exercises. I found them immensely exciting, and worked hard to master them quickly so that I could join in the work of the general class. At that time, Gurdjieff was preparing a special class—composed almost exclusively of Russians—to give public demonstrations. The general class could learn any new exercises, but did not take part in the special training reserved for the demonstration class. 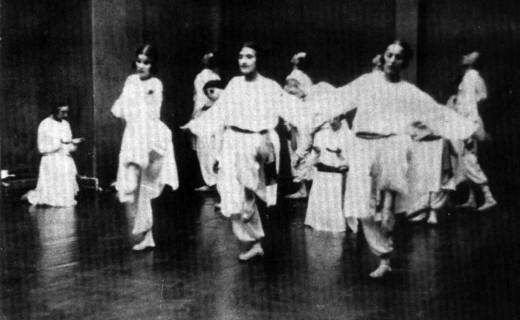 Gurdjieff’s method of creating new exercises had a living spontaneity that was one secret of his success as a teacher. While the new pupils were practicing on the stage, some of the Russians would gather round the piano, where Thomas de Hartmann sat with his bald head perked like a bird. Gurdjieff would begin to tap a rhythm on the piano top. When it was clear to all, he hummed a melody or played it with one hand on the piano and then walked away. Hartmann would develop a theme to fit the rhythm and the melody. If he went wrong, Gurdjieff would shout at him and Hartmann would shout furiously back. Then the older class would line up in rows, and we would stand at the side and watch, or go back to our places on the floor. Gurdjieff would teach the postures and gestures of the exercises partly by doing them himself; or, if they were complicated, involving different movements by different rows or positions, he would walk round and place each pupil in the desired posture. There would be vehement arguments. The stage became a chaos of dispute, gesticulation and shouting as the pupils tried to work out the sequence required. Suddenly, Gurdjieff would give a peremptory shout and there would be a dead silence. A few words of explanation, and de Hartmann would begin to play the theme, which by then he had worked out into a rich harmony. Sometimes the result was spectacular: a beautiful ensemble never seen before would appear as if by magic. At other times, the task was too difficult and the exercise broke down, to be worked over for hours during the succeeding days. In addition to the set exercises, many hours were spent in performing rhythms with the feet to music improvised by Hartmann. Sometimes Gurdjieff also used his famous Stop Exercise. At any moment of the day or night, he might shout: “Stop!” when everyone within hearing had to arrest all movement. First the eyes were to fix upon the object of their gaze. The body was to remain motionless in the exact posture of the moment the word ‘stop’ was heard, and the thought present in the mind was to be held. In short, every voluntary movement was to be arrested and held. The Stop might last a few seconds, or five, ten minutes or more. The posture might be painful or even dangerous; but, if we were sincere and conscientious, we would do nothing to ease it. We had to wait until Gurdjieff shouted “Davay!” or, “Continue!” and then resume what we had been doing before. The rhythmic exercises were often so complicated and unnatural that I despaired of learning them. And yet, again and again, a minor miracle occurred. After hours of fruitless and maddening struggle, the body would suddenly give way, and the impossible movement would be made. The work in the Study House always continued until midnight and often much later, so that we seldom had more than three or four hours’ sleep before starting the morning’s work. About midnight Gurdjieff would call out: “Kto hochet spat, mojet itti spat,” or “Who want sleep go sleep.” One or two would get up and go out, but the great majority remained, knowing that often the most interesting explanations and demonstrations were given after the regular work was done. These two excerpts are taken from John Bennett’s autobiography, Witness: the Story of a Search. London: Hodder & Stoughton, 1962, pp. 46–48, 90–91. Published with the kind permission of Bennett Books. John G. Bennett was a British scientist, mathematician, and philosopher who integrated scientific research with studies of Asiatic languages and religions. While in Constantinople in 1921—during the aftermath of the Great War and the Russian Revolution—he met both G. I. Gurdjieff and P. D. Ouspensky. These meetings shaped the direction of his spiritual development and in the summer of 1923, he spent three months at Gurdjieff’s Institute for the Harmonious Development of Man in France.